1. Exercise the instrument rating! 2. Visit some new states! 3. Take more people flying! The third goal ("take more people flying!") sums up the overall theme of the year: I flew with more people this year than I think I have any other. Excluding members of my family, I flew with 34 other people this year. Ten of them were pilots that included one CFI, two safety pilots, two lapsed pilots, and three student pilots. At least ten of them were kids, several of whom took the controls for the first time. Thanks to Kent, Ellie, Neil, Darrell, Mike, Dan, Ashley, Doug, Lee, Joe, Leah, Gary, Randy, Brenda, Stacey, Terry, Micah, Erika, Ryan, Matt R, Kylie, Matt P, and Devon for sharing time in the air with me. Many of these shared aeronautical experiences came about as a direct result of joining the Williamson Flying Club. As a member of the club's activities committee, I always brought other club members with me on group fly-outs. Additionally, I flew eleven passengers in Archer N1185X at the 50th Annual Williamson Apple Blossom Festival Pancake Breakfast. As a result of that experience, I also have some hours (4.4, to be precise) of PIC time logged in an airplane other than Warrior 481 for the first time since I flew in the Rockies. In 2014, I landed at airports in Connecticut, Maine, Maryland, Michigan, North Carolina, Pennsylvania, Virginia, and, of course, New York. The landing in Maine satisfied my second objective of the year, to visit some new states. I landed at 28 different airports in 2014, ten of which were new to me, bringing my airport total up to 157. 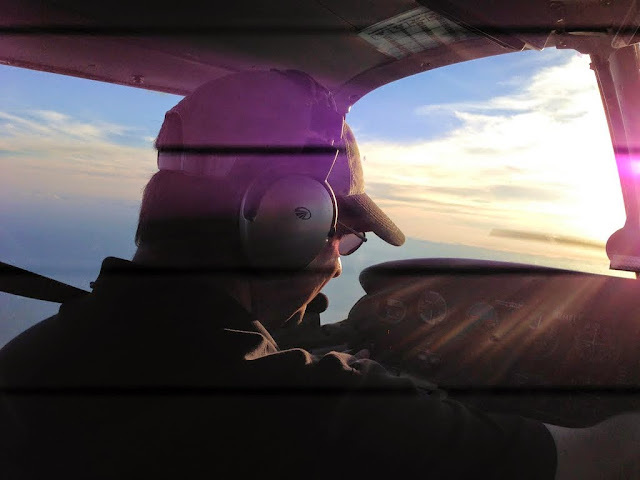 My number one goal for 2014 was to exercise a relatively new instrument rating. The rating proved useful during flights to and from North Carolina, Michigan, and Connecticut. In 2014, I did my first IFR departure (Kalamazoo) and flew my first STAR and SID (both at Ann Arbor, the CRUXX5 arrival and MOONN5 departure). I logged 5.1 hours in actual instrument meteorological conditions (IMC) and 7.2 hours of simulated IFR under the hood with safety pilots. I flew 18 instrument approaches, but only one of them was in actual IMC. Thanks goes to Darrell and Randy for helping me stay current. And, of course, there is the recurrent objective of surpassing 100 flight hours each year. At 125.8 hours in 2014 for a total of 1363.5, that goal was met easily. Six year old at the controls! I was very fortunate in 2014 to fly often with my family. The Bear logged 42.9 hours in 2014 for a grand total of 267.5 since birth. Kristy joined us for 34.9 of those hours (in fact, she is out of frame in the above photo, turning green at The Bear's flying). ...and a round trip journey to southeast North Carolina that featured some in-depth lessons in multiple IFR re-routes (in some of the most sensitive airspace in the United States, no less) and severe weather avoidance. 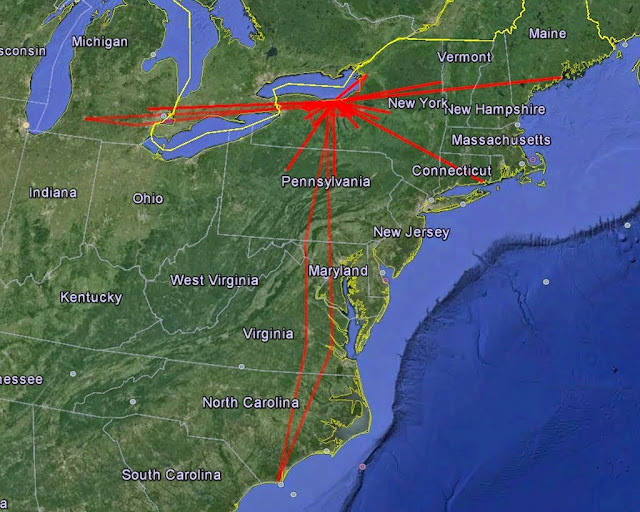 Other flights of note include a solo journey to Maine to visit the Owl's Head Transportation Museum; a flight with friends to visit other friends in Groton, CT; a visit to Kalamazoo and Ann Arbor, MI; and a trip back to the home town in Michigan to see family. Local flying included twelve $100 hamburger runs including en route stops at airport diners on longer flying trips (and at least one to-die-for crab roll in Maine). Of these, four were fly-in breakfasts (Frankfort-Highland Airport, Oswego County Airport [2x], and Perry-Warsaw Municipal Airport). I had the good fortune to meet-up with Jeff and Gary, both aviation bloggers whom I have known for years, but not met in person until 2014. One of the more interesting flights of the year was very close to home: an aerial survey of the rare, high ice coverage on Lake Ontario at the end of an unusually long and cold winter. 2014 marked a decade since purchasing Warrior 481. It was our aluminum anniversary together. She may not be the most powerful, fastest, or most exciting airplane, but remains a reasonable compromise for making family trips and puttering about the local area. For a low wing aircraft, she's not a bad photography platform, either. Sometimes, I even let the wing remain in the shot (below, but only because the sunset had turned it pink). As the year comes to a close, it is clear to me that 2014 was a good year to fly, even if it was overshadowed by unwelcome drama in other aspects of my life. After years of seeking a more sociable aviation circle, I seem to have found it. For that, I am grateful. What's on tap for next year? Is it fair to declare 2014 a success, then turn around and state the same objectives for 2015? I think it is, as long as it reflects continued growth. Next year I want to continue exercising and honing the privilege of instrument flight, fly with more people, and go places we've never gone before (hopefully adding some states in the process). At least, those goals should make for a good start. Merry Christmas and Happy New Year to all! Thanks for reading. My hangar door is a portal, an escape hatch to realms beautiful and fantastic. From above, the absurdity of life on the surface fades away. In some ways, we live better in the sky.